Harrod UK has 4 sets of rugby posts to give away to 4 deserving rugby clubs across the country. The rugby posts will be the No2 10m Hinged Steel Rugby Posts. To view these rugby posts please click here. The dates that this competition will run from are the 30th May 2017 until the 14th July. Harrod UK have teamed up with the RFU to bring you this amazing opportunity to win your club a set of brand new shiny rugby posts! 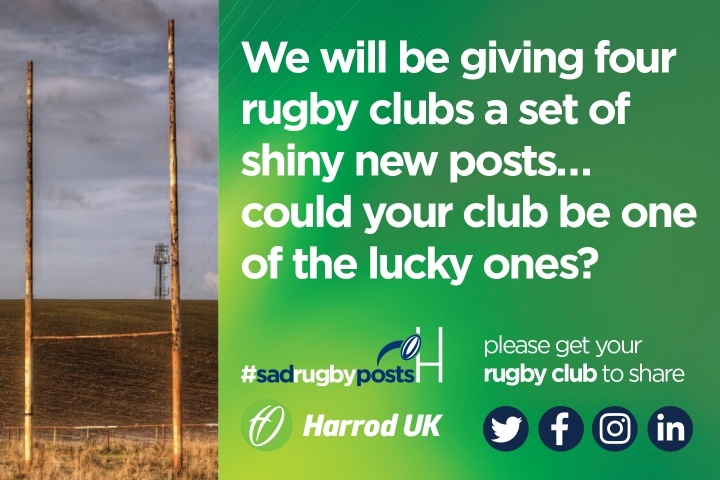 For your chance to win please simply get your rugby club to send in a photo of your #sadrugbyposts and your team members showing how sad they are to sportsmarketing@harrod.uk.com including a description of why you think you deserve to win and make sure you follow on twitter https://twitter.com/HarrodUKand on facebook https://www.facebook.com/HarrodUkLtd/and Instagram https://www.instagram.com/harroduk/make sure to post your photos on social media and share, share, share!!! Entries will close at 12pm on Friday 14th July and the winning clubs will be chosen by members of the RFU. Only people attached to official rugby clubs can enter and will be accepted. We also request that all clubs who win send an image of your new posts with a team picture. Compeition only open to the United Kingdom.